What a bummer, I was really hoping Unity tanked forcing Ubisoft to rethink their ways. I think last gen. they could have easily crippled the PS3 in the US if they would have been more competitive with the price, and used their pockets to effectively eliminate all competition. They did not do that tough, and will not do it in the future because all they care about is having a profitable division, not being a monopoly in the gameing space. Yeah, this is something I wish fanboys would realize. The ones who keep saying stuff thinking the Xbox division has unlimited funds. They don't, and even if they did there are reasons besides money why some will take them on their offers and others will still refuse those same offers. I'm not saying they should be ashamed of using their financial situation to their advantage, and I get that business isn't about playing nice. Tbh, I think MS would rather have Sony around as a competitor rather than wiping them out and someone new, like Google or Samsung or Apple, stepping in. Because I think they're genuinely afraid of those companies, but kind of see Sony more as a "measured" rival. ....Like Ryu and Ken x3. Also just want to take a moment here, wish everyone a happy holidays. Have a fun Christmas y'all! Pokemon ORAS/2 =~ Smash Wii U =~ Far Cry 4 =~ AC Unity (unbundled) with DA:I a bit lower. Most of these titles sold remarkably similarly. As such, moving up and down those lower ranks doesn't require a huge increase in sales. Anyways, AC:Unity Bundle > AC Unity unbundled from what I understand, making this even less important. 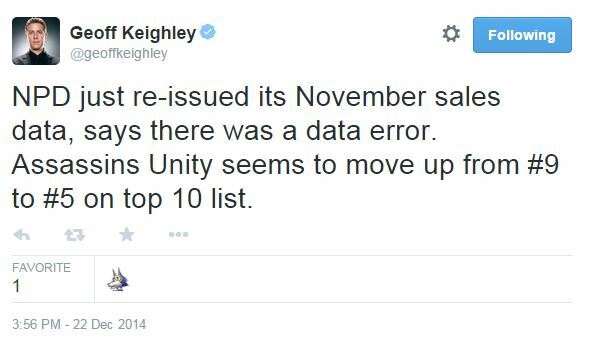 AC Unity probably sold as well as it did at launch because people were somewhat happy with Black Flag. If people are unhappy with Unity, I'm sure we'll see a huge decrease with the next iteration, since that's how it seems to work. Probably just has an alarm go off and auto-responds. Not even close. Also, it hasn't been doing well in Europe, it's only been doing well in the UK. And the only reason it's charting so highly there is because of the massive bundling. It's not even like a destiny bundle or even an AC bundle, it's being bundled with 3-4 other popular games like GTA, CoD, Destiny, FC4, etc. Pretty ridiculous to peg Driveclub as some big seller when it's only sold ~55k in the US and elsewhere is only charting in the UK(due to bundle), Australia and sometimes NZ. Where did I peg DC as some big seller. Exactly the opposite of my point. The point is no exclusives are moving systems, asscreed, CoD, Destiny, etc are. There's like a 1% of the population who come here to post how ms exclusives are why they bought the system over ps4 like it's a factor. It's price + the usual rehashed games [ I buy them too]. Same formula as ever before. I stated right from day 1 I'd pick up an Xbox at 299 in about 2015, doesn't look too improbable now. I'm not sure if this has been mentioned but I was just looking at the Amazon bestseller for Videogames and noticed that the $399 PS4 has overtaken the $349 XB1 bundle. Looking at the PS4 more closely and found that they are giving away two games with it. Sony finally figured out that they can't stay at $399 with just the console and compete with the XB1 bundles. I think December numbers are going to be very interesting. Hourly charts are meaningless unless they show a trend for a week. I have no insight into Europe, but it's selling miserably in the US. Bayo 2 outsold it fairly easily, which should prove my point. It updated yesterday, and Xbox actually jumped from #2 to #1. PS4 also seeing a significant jump from mid-30s to placing 19th so far. Glad to see that both Unity and Dragon Age sold well this month. Off to pick up GTAV later today. Heh, very interesting. The PS4 must have done some amazing numbers to go from mid-30s to #19 in a relatively short time. Wonder how well both consoles would do on Christmas eve. P.S. I'm in Malaysia, so it is now the night of Christmas eve, what time is it in the US now? NPD time should be 0937 right now, it was six hours behind me. The rest of the US is same time or some hours behind.